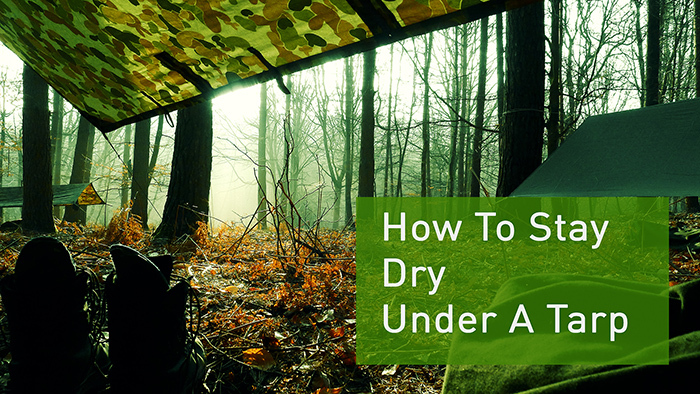 How do you stay dry under a tarp? How do you not get wet under a tarp? How do you avoid getting water running under your tarp? How to stop rain coming under a tarp? How to stop water coming under my tarp? All these questions are variations on a theme that have been asked of me for the #AskPaulKirtley show. I’ve also received some fairly dumb comments on some of my tarp-related videos on YouTube. ALWAYS GOOD TO LISTEN TO YOU PAUL. NO NONSENSE ALL SENSE. The answer I thought you were getting at is you can’t get 100% with a tarp because a tarp isn’t a permanent shelter system, it is a temporary one, so the consequences of getting a little wet isn’t bad as long as you aren’t compromising your body heat. Precautions are suggested and I’m glad that was added, but a bivvy bag is pretty much its own type of shelter system IMO and I wouldn’t suggest a bivvy bag for a tarp system, but rather a tarp for a bivvy bag system. How I’ve done it usually with only a tarp is a larger tarp (6’x8′) and wrapping it like an upside down 7 with the horizontal length underneath me. Elevation rises behind me or at least descends in front so water doesn’t come towards the open side. Wind direction will effect my choice more, but that is typical for what I look for. Thank you Paul. Very well explained and thought out. I really enjoy your spiels. Experience flows from you. I have used chlorine tablets in the past, but their use by date always puts me off them and obviously I have boiled water too! In answer to your question – my preferred method is boiling, I have never had a problem with boiled water, I will use chlorine, but hate the taste and the used by date and I’ve even collected rain water wjth a friend in the tropical north east of Australia and drunk it without treatment and it was amazing!! What I’m skeptical about has to be not actually using any method! Sounds a bit strange, but I’m so reluctant to drink any water (besides rain water in a clean environment away from cities, and dense tree canopy) where many other people will risk drinking water from a source that I wouldn’t. Fraser Island for example, we were swimming down a fresh water stream and it is well known that people can aparantly drink the water that is comming down stream as it comes out from underground, but there is still 10-15 meters of space between the source and where you can drink it!!! Needless to say I didn’t. All the best and warm regards. It’s surprising how many people can’t follow common sense. You inspired me to ditch my tent for a tarp. Unfortunately someone had built a shelter in the only piece of flat ground near our site, so I used it instead. I followed your advice and had a great trip. What I find strange is the fact that you are getting criticism for issuing good advice, for FREE. These idiots need to step back. I am very likely one of those asking dumb questions, so thank you for your patience in providing advice. You have inspired me to push myself a little further on my bushcraft journey each time I venture out. congratulations on answering the question about inteligent tarp placement. You succesfully controlled your anoyance but still managed chastise the dumb questioners without being rude, brilliant. Great information too. Your patience is astounding Paul. Once again you have slowly and clearly outlined the theory involved in setting up a tarp to avoid getting wet. The key thing that I feel should be taken from this is the fact that each situation is different, due to the variable cover, weather and terrain. Thanks Paul for once again taking some of your precious time to share your knowledge and vast experience. Keep safe, please keep sharing. All the best, Dave. I find because I always sleep in a fetal position I find that having the sleeping mat inside the bivi bag prevents me finding a comfortable sleeping position. So I always leave the mat outside the bivi. There is a risk of puncturing the mat – I always do a good sweep first – and so far have been lucky. I was wondering if a half mat would make a difference? As always brilliantly delivered video. Thank you for sharing your knowledge on tarp placement. I am a complete novice at bush-craft, but with your series of “Ask Paul Kirtly” I am getting answers to questions that I would never have thought of. I now view you videos on your website, so I have not seen the comments from Youtube. But I did see the (Somewhat sarcastic) video where it was wet out there, and dry under here! Now I understand why you did that video. Have a good one! 🙂 Kev B. Good post Paul. I have considerable experience camping in the Colorado mountains and surrounding states. I have used tarps and tents of various configurations and of course they both have their benefits. Pound for pound it’s hard to beat a tarp to lighten the load on a grueling trail at high altitudes. I like at least a 9×9 ft tarp but now use 10×12 ft tarp for extra comfort and alternative setup (2 lbs). When rigging a tarp in uncertain weather (wind often blows up to 45 mph here) it is best to allow for dropping the wings to the ground for severe weather then ease them up for morning brew and breakfast enjoyment. Glad you mentioned checking overhead for hazards. Tent or tarp won’t protect from widow makers. Avoid camping in areas of previous blow downs especially in the quakeys or the jack pines.